Altiverb was one of the first convolution reverbs. Is it still the best? Since we first reviewed Audio Ease's Altiverb Mac-based convolution reverb plug-in back in 2002, many more convolution-based plug-ins have sprung up, but Altiverb still has a reputation for sounding a little bit special. All convolution-based reverbs are extremely processor-intensive, and back in 2002 when the Mac G4 was the epitome of power processing, running a convolution algorithm ate up a lot of the available processing power. These days, however, we can take advantage of what they have to offer without trading that off against the use of other plug-ins. Normally you work from a library of impulse responses recorded in concert halls, studios, clubs and other acoustically useful places, but it is also possible to create your own. The included Altiverb IR Pre-processor is a separate software application that allows you to use sine sweeps, balloon bursts or starting-pistol shots to sample your own spaces. Like most convolution devices, Altiverb can also be used to sample other linear processes, by which I mean ones that don't include time envelopes, pitch modulation or distortion. You could for example, use it to model the response of a favourite equaliser setting or even a guitar speaker cabinet, and it will also sample delay effects (including hardware reverb devices that don't use internal modulation), though anything that uses modulation, such as chorus, flanging and vibrato, can't be captured this way. Similarly, amplifier distortion and compression can't be emulated using conventional convolution. Altiverb has evolved since its inception, with perhaps the most significant addition being the ability to produce surround reverb effects, though the way this is achieved is rather different to the way some competing products handle it. The two basic surround formats are mono-in, quad-out and stereo-in, quad-out, which Audio Ease feel produce the best subjective sound for music. Where reverb is required in the centre channel, they have a mode where the rear reverbs are summed to mono and then delayed before being fed to the centre speaker, though this is recommended mainly for film work rather than music. The all-important IR library has also been extended and of course there's support for plug-in formats that didn't even exist back in 2002, such as Audio Units. Altiverb v2 was the last version to support Mac OS 9, and the current version is strictly OS X-only. Authorisation is via the Audio Ease web site using a challenge-and-response system or to an iLok key, which has the advantage of allowing you to move the program between computers more easily. Altiverb 's plug-in window is a hint on the wide side and offers relatively few controls; the reason for the amount of real estate is the colourful reverb display, which can show either the IR decay profiles or a 3D waterfall plot. A help function can be switched on or off to show the relevant information when you pass the mouse over a specific control area, and further information on the reverberant space is displayed to the right of the decay graphics. Convolution reverbs traditionally have the limitation that what you record is what you get, but (as Waves did with IR1) Audio Ease have put in place a few processing tricks for modifying the impulse response to allow, for example, the reverb time and tonal content to be modified. When you adjust these, the impulse response has to be recalculated, which takes a second or two, but there's a user preference that switches the changes from being continuously recalculated to being recalculated only when you release the mouse button, the latter being the most practical option. Reverb Time is adjustable both upwards and downwards (in earlier versions it was only downwards) via a large on-screen knob, while selecting impulse responses and the choice of miking setups where available is done using conventional menus. Two operating modes are available; one achieves a lower processor load at the expense of a latency of around one second, while the other offers zero latency at the expense of higher processor load. As with all convolution reverbs, the longer the reverb tail, the more processing is required. For this reason, you can opt to truncate the tail to save on CPU power; in many cases this can be done with little or no audible effect to the sound. Altiverb can be used in sessions at any sample rate providing the buffer size is set to a multiple of 256 samples, though its internal processing is always done at 44.1kHz or 48kHz. Audio Ease say that their designers found no useful reverberant audio information above 17kHz, and increasing the sample rate would have dramatically increased the processing load. Photos of the environments in which the IRs were recorded can be viewed at the right-hand side of the screen and many now include a 3D virtual-reality panning camera shot of the venue. This section also includes diagrams of the mic and speaker placement used. When the 'position' parameter is being adjusted, a graphic of a speaker on a wooden floor is shown, and you can drag the speaker around to change the left/right position (or stereo width for stereo-input reverbs) and the distance. Many of Audio Ease's preset IRs come with extensive visual information about the space that has been 'sampled'. The other key controls provide a two-band Baxandall equaliser to modify the reverb sound and a set of three-band damping controls to change the relative decay time at different frequencies — a process that entails processing and recalculating the IR. In addition to being able to adjust the level of the direct, early and late reverb components individually, it is also possible to change their delay times relative to each other. Yet another nice touch is that up to 10 preset slots can be set up with different reverb settings to be called up by automation from within the host sequencer. All the IRs include the direct sound from the speaker, which is of course the first sound to arrive at the mic used to record the IRs. This is coloured by the sound of the speaker and mic used as well as suffering a little high-frequency loss from air absorption, so there is the option of replacing this with the uncoloured direct sound from the source being processed, if preferred. The level of the early reflections and later reverb tail can also be controlled independently, as can the virtual room size, a process that works by shifting the pitch of the room resonances. How well changing the room size works depends on the original sound and how far you want to adjust it, but used over a sensible range it is very effective. To help the user evaluate the adjustments, there's a little panel that can be used to trigger four types of test sample, including drums, horns and vocal, to hear what the reverb sounds like without having to play back an audio file. These cycle round a few examples each time they are used and if you switch on the adjacent Auto button, one of the drum sounds fires every time you adjust the IR so that you can hear what effect your changes have had. The idea behind convolution reverb is that if you were to generate a sound impulse just one sample in length within a real reverberant environment and then record the resulting reverb, you'd be able to apply that reverb tail to each individual sample in your new recordings, add the results together in real time and recreate the sound of your track playing in that original acoustic space. However, because a single-sample impulse doesn't provide enough acoustic energy to make a reliable recording, it's now more common to use a sine-wave sweep and then mathematically transform the resultant recording into what you would have got had you used an impulse in the first place. This short audio decay tail is, not surprisingly, called an impulse response or IR. Depending on where the speakers and mics are set up in the room, you can recreate the effect of the performers and listeners being in different parts of the room. The reason convolution reverbs are so processor-intensive is that there's a lot of brute-force number-crunching involved, even though the basic concept is fairly straightforward. I checked out Altiverb running as an Audio Unit plug-in within Logic 7.1 running on a dual 2.7GHz G5 fitted with 4GB of RAM, so I wasn't short of CPU power. In fact Altiverb uses rather less CPU resources than any other convolution reverb I've tried (though more in quad mode, understandably), and providing you only use a few instances in your mix, the load is quite acceptable. The library of IRs has expanded enormously since we last looked at Altiverb and now includes some very nice EMT plates and sampled hardware reverb units as well as a splendid range of concert halls, churches, cathedrals, smaller venues, rooms and other interesting spaces. Many of the presets open up a further choice of miking arrangements and distances, so the library is actually a lot bigger than it might at first appear. I don't know whether it's something about the Altiverb engine or just the way the impulse responses are recorded, but these reverbs sit fantastically well in the mix, almost regardless of which one you choose — within reason. There's just the right sense of space and density, without the original sound seeming overwhelmed or disembodied, and the best way I can describe the sound is as 'expensive'. There are some particularly nice echo rooms that work brilliantly on vocals, and extra IRs are being added to the Audio Ease site every few weeks — once you've registered, you can download these free of charge. Testing anything surround in Logic is a bit tricky because there's no direct way to insert multi-channel effects in audio tracks or busses — at least, none that I can find. You can, however, set up a surround instrument track, insert Altiverb into that as a multi-channel effect, then use the side-chain input selector in the Altiverb window to select your usual effects buss as an input source. This gives you mono in or stereo in depending on whether the source is a mono or stereo buss, but the reverb output is in surround and routed to the designated surround outputs set up in Logic 's surround preferences. As explained earlier, the reverb is really quad, with a mix of signals being used to feed the centre (and LFE) channel, but I can't see any real reason for putting reverb in the LFE channel anyway unless you're making disaster movies, and music sounds wider if the reverb isn't fed to the centre channel. To my ears the surround reverbs are very effective, adding the necessary front-to-back perspective without getting in the way. However there is what seems to be an operating anomaly, insomuch as when you call up a new preset, the ones that don't conform to your required channel arrangement are greyed out. It would make more sense to me to perhaps show you all the 'greyed out' presets in another colour to warn you but to still allow you to load them with their own choice of configurations. Also, where a surround option isn't available, it would be really handy to be able to select one stereo reverb as the front speaker feed and a different one for the rear speaker feed. It may not be the 'proper' way to create surround reverb, but sometimes such trickery can work very well on an artistic level. Altiverb is one of the more expensive native plug-ins, but there's no arguing that it delivers on both quality and variety. The user interface allows a realistic amount of tonal tweaking without destroying the natural character of the IR you're working on, but the real star of the show is the way the reverbs integrate into a mix, adding that magical sparkle and gloss to everything but without sounding overstated or messy. The surround modes are hassle-free and as simple to use as your host DAW allows, and the bonus of new IRs available from the Audio Ease site is the icing on what is already a very nice cake. Whether Logic Pro users will feel it worthwhile paying the extra for Altiverb when they already have Space Designer is questionable, but to me the plug-ins have very different characters, so professional users may well still go for it. Compared with earlier versions, Altiverb 5 offers more adjustment and a bigger IR library, not to mention some seriously flashy graphics — waterfall plots and 3D venue tours not being the least of them. It can also produce some very natural-sounding surround reverbs. When it was first released, it was thought by many to be the best software reverb available at any price, and from what I've heard, it just might retain that reputation. 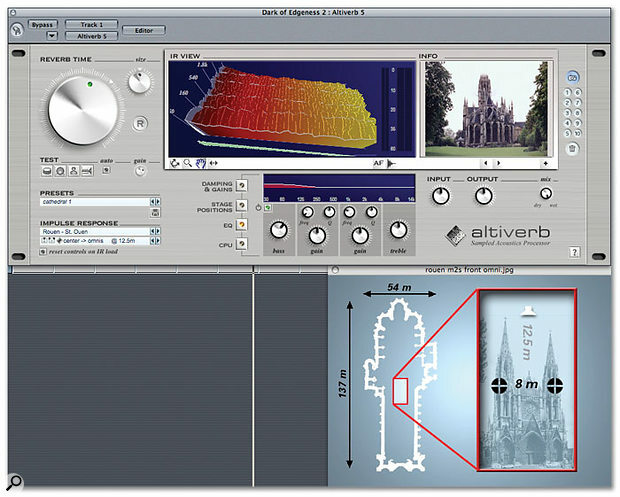 Altiverb is a truly professional-quality software reverb capable of producing excellent stereo and surround results in both music and video post-production environments. VST/RTAS/AU/MAS version £381.88; HTDM version £575.75. Prices include VAT.